THE centenary of the onset of World War I was a principal theme of the inaugural issue of Horizons, with authors reflecting on whether sufficient wherewithal has been acquired over the past hundred years to manage international crises so they do not morph into epic tragedies. The current faceoff between the West and Russia—the main topic of this issue—has come to represent a warning of how we remain vulnerable to an unanticipated escalation of tensions in our times. IF there had been any justification in affirming not too long ago that the world was at the end of history, then one might justifiably affirm that today’s events have brought about a portentous reversal of its course. The onset of an atmosphere of confrontation is in many ways reminiscent of the Cold War. MUCH of the world has not yet come to feel the adverse consequences. However, a further deterioration of relations between the West and Russia—fueled by the continuous pounding of diametrically opposed narratives about the origins of the crisis—would undoubtedly reverberate across the globe. Already, cooperation and coordination have been reduced to levels unseen in decades. This is hardly conducive to strengthening global peace and security, starting with the increasingly precarious Middle East. AND yet 2015 is a year in which key challenges to the future of our planet will require more, not less, intergovernmental cooperation—especially at the United Nations. In the next 12 months, world leaders will need to come to an agreement on the post-2015 sustainable development agenda and negotiate a seminal climate change accord. This issue of Horizons features several essays on various aspects of this critical topic. Helsinki Final Act. 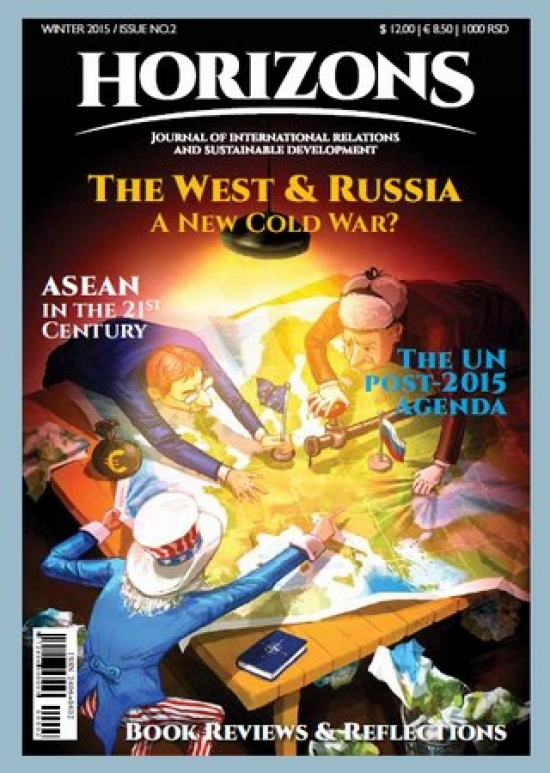 This issue of Horizons also includes articles on ASEAN, an organization that aspires to serve as a platform for transforming Southeast Asia’s outstanding challenges into opportunities for all concerned. The experience of the OSCE space demonstrates, however, that hard-earned gains cannot be taken for granted. THE present issue of Horizons also contains the views of respected African leaders, and concludes with reflections on what are widely considered to be two of the most important books of 2014. It is our hope that platforms such as this, which offer a multiplicity of viewpoints, can help us move closer to a more balanced world order, based on greater equality.